In the foothills of the Andes and close to the best outdoor activities in the Los Lagos region, come be charmed by this architect designed La Casa de Vistas Divinas, 'The House of Divine Views', a beautifully decorated, three bedroom, two bath home with Chilean woods, cathedral ceilings, and huge picture windows overlooking the panoramic, snow-capped volcanoes of Mount Osorno, Puntiaguido, and Calbuco. No other vacation rental in this area has this glorious view! The only sounds are the birds, the river, and the waterfall. The walls are decorated with original oil paintings featuring artists from Argentina and Chile. Most of the furniture has been designed and made by local craftspeople. The master bedroom, with a high quality king-size bed, looks out towards the snow-capped Volcan Osorno. There is a large walk-in closet and private bath. The two downstairs bedrooms, which share a large bath with an indoor jacuzzi, feature a double bed, and a trundle with 2 twin beds The bed linen is all 100% cotton, high thread count. The pillows and duvets are made from wonderful Chilean down. Hiking in the nearby Vicente Rosales National Park, river rafting on the Petrohue River (the Petrohue waterfall is one of the most photographed waterfalls in the world), climbing Volcan Osorno (a 30 minute drive to the Osorno ski lift) or Calbuco (which is right out your back door), horseback riding, fly fishing in your own private river, windsufing on Lake Todos Los Santos, mountain biking and birdwatching, canopy rides, paddling a kayak down the Ralun Bay, or canyoning through the gorges of Rio Blanco. Day trips can include a visit to Chiloe Island, the Angelmo native crafts market, boutique shops, and large shopping malls in Puerto Montt, the historic towns of Fruitillar and Puerto Octay, the spa at Puyehue, and Alerce Andino National Park. The casino and the variety of excellent restaurants in Puerto Varas (especially La Cucina D’Alessandro, offering authentic Italian cuisine) makes for a fun evening experience. Even closer, only 15 minutes from the house, you can dine at the five star Latitude 42 restaurant in the Yan Kee Way Lodge in Ensenada or at the Hotel Petrohue restaurant on the banks of Lake Todos Los Santos. Overnight excursions to Bariloche and Villa La Angostura just over the border in the Argentinia Andes are easily arranged. Ensenada is embarkation point for the famous Andean lake cruise crossing from Chile to Argentina. Or perhaps you would just want to relax on the terraza in an Adirondack chair with a good book while you watch a native Chilean hawk soar gracefully above, or take a nap in the hammock under the Ulmo trees. The hawks visit the yard at dawn and dusk in search of an occasional scrap of leftover meat. If you are lucky like many have been, you may get a glimpse of the rarely seen Pudu, the adorable indigenous dwarf deer of Patagonia. The surrounding yard and gardens have been designed and planted to the owner’s specifications and include many beautiful trees and flowers that are the delight of the local species of hummingbirds. The home is set in the middle of an old growth Valdivian rain forest but within a natural clearing that offers spectacular views of the surrounding volcanoes. Let the majesty of the volcanoes seduce you into a state of sublime and spiritual relaxation. The house has gas heaters, electric heaters, a wood burning stove, and a huge fireplace, all contributing to a warm and relaxed ambience. After a colorful sunset, gaze at the entire Milky Way, the Southern Cross, and other constellations of the Southern Hemisphere. The absence of light pollution creates optimal viewing to the center of the galaxy. If your party is larger than the number the house can sleep comfortably ( 7 plus the option of an additional futon) you can also reserve the guest-house (casita/cabin) on the same property with the same incredible views. The cabin has a queen size bed, a full galley kitchen, bathroom with shower, small living room with a dining table and a large deck. It is warmed by a wood-burning fireplace. It is comfortable and nicely appointed. 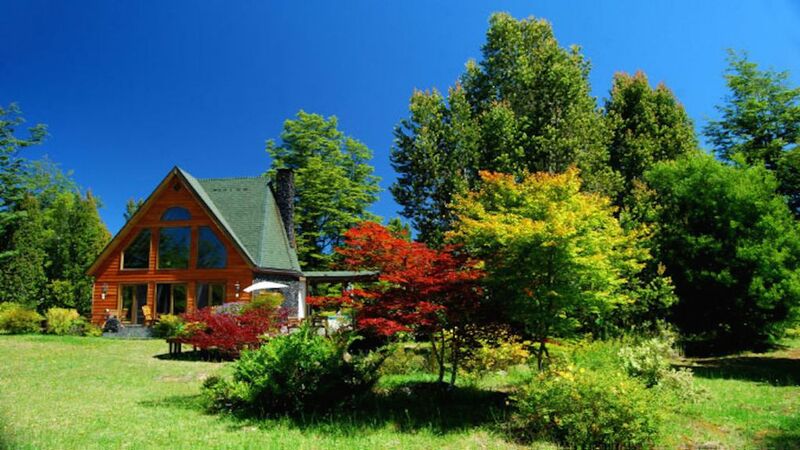 Your comfortable, magical, Chilean vacation rental home is just a click away. Born in Long Island but a resident of Hawaii since 1968. On a 1998 trip to South America I fell in love with Southern Chile and bought land in an eco- development with waterfalls and hardwood forests. I built this home in 2001, and have loved vacationing here ever since. You will too! The house sits in the middle of a protected Chilean rain forest with spectacular views of Mt. Osorno and Mt. Calbuco. There is a private river close by abounding with trout in season. Very quiet and peaceful. If you are a birder you will be in heaven here. It is peaceful and quiet with great hikes, unique wildlife, and wonderful views of the volcanoes in the day and the galaxy at night. My Swiss manager makes sure everything will be perfect for your stay. gas stoves, wood burning stove, electric heaters in bedrooms & bathrooms plus a large fireplace. The dinning table seats 6 but 2 chairs can easily be added. I have done that for lots of dinner parties. A family of three adults, we spent a week in December 2014 in this charming chalet-style house. The description, photographs, specifications, and reviews from other guests are all accurate and don't need repeating here. The place is roomy and very comfortable, everything works and is as uptodate as can be given that it is in a remote Chilean location. The decor is warm and homey, the kitchen more than fully equipped, and the beds very comfortable. The owner was lodging in the nearby cabin during our stay, and acted as an attentive host, including help with a balky lock, operation of the hot tub, and even to laying fires in the stove and fireplace. This not your run-of-the-mill sterile, anonymous, timeshare type of rental. We are completely satisfied with our stay and highly recommend the House of Divine Views. Foxes, hawks and caracaras visit regularly, in pairs, and they are partial to hot dogs - bring a generous supply! Private Fishing Waters and many other outdoor activities.